Nobles Restaurant closed its doors on Saturday 23rd July! After a fantastic 9 year run, Nobles has won many prestigious awards/accolades over these years, but they now feel it is the right time to bring something fresh and new into Battle! Since the launch in June 2007, Nobles still remains top restaurant on Trip Advisor in Battle, regularly wins top 20% restaurant recognitions on both Open Table & Trip Advisor and has won lots of local awards too! They even won the Judge's Special Recognition Award for ‘Place To Eat & Drink' 2016 in this year's 1066 Business Awards only recently! However, Debbie & Paul Noble now feel Battle needs something modern, casual, fun and relaxing. 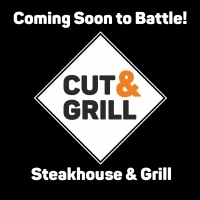 We are, therefore, excited to launch our new dining creation - CUT & GRILL. CUT & GRILL is a steakhouse which specialises in local quality steaks, fresh handmade steak burgers and a selection of grills, including among others fresh salmon, vegetable kebab and our speciality Cut & Grill Mixed Grill. There is a great Kids & Smaller Appetite Menu too! The launch date is Tuesday 2nd August 2016 from 5pm and we look forward to welcoming you and your friends and family to our new venture.